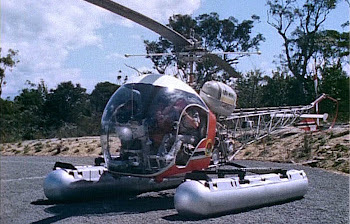 For some years now I have been trying to locate the surviving Skippy (1960s Australian television series) helicopter VH-AHI with a view towards having it repatriated and preserved in Australia. After serving in PNG it later appeared on the U.S. civil register as N1164T. In 2012 it was permanently deleted from that register however in 2014 I was eventually able to track down its current owner – a helicopter spares dealer in Florida – who was happy to sell the unairworthy but mostly complete airframe for $US5,000. VA-AHI on location ourside the Waratah Park Ranger headquarters. Despite my best efforts, neither the National Museum of Australia, the Powerhouse Museum, the National Film and Sound Archives or the Metropolitan Local Aboriginal Land Council (which now owns Waratah Park where the television series was filmed) expressed the slightest interest in this proposition. This unique item of national cultural heritage significance has now been scrapped. The dealer in Florida emailed me last week to say he would sell VH-AHI’s logbooks and manufacturer’s plate for $US1,500. Was a time, once, when I would have pulled out all the stops to ensure these also found a home in a suitable Australian collecting institution. A hard lesson.